The 3 inch Gun Carrier is a Rank II British tank destroyer with a battle rating of 3.0 (AB/RB/SB). 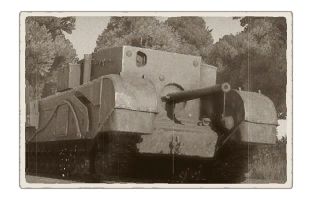 It was introduced along with the entire British tree line in Update 1.55 "Royal Armour". 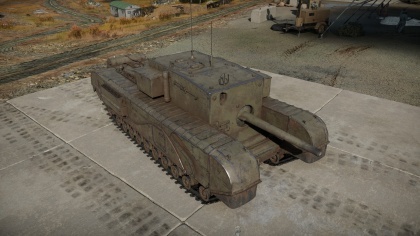 This abomination of a vehicle is based on a Churchill chassis. It sport a 3-inch gun that they couldn't fit into a normal Churchill turret, but in the world's boxiest crew compartment. In all seriousness, you will likely see the tracks (and suspension) before you see anything else. Once you've recognized that there is no turret, then you know its a 3-inch Gun Carrier. The 3 inch Gun Carrier is an interesting tank that can be difficult to play. Combining the aspects of an assault gun and a tank destroyer, it has a strange play style. At longer ranges, getting a penetration with the main gun can be difficult whilst the small arc and low turn rate makes close quarters fighting extremely hazardous. The first thing to take note of is your armour - at 89mm on the front you are one of the toughest vehicles at this rank. However this armour is flat and unsloped. At the sides the armour drops to 76 mm and the rear is only 25 mm thick meaning that, when combined with the positioning of the crew, a penetration from either of these angles is usually deadly. Ammo racks of the 3-inch Gun Carrier. The first thing you need to worry about are your flanks. If the enemy gets on to these you will usually be knocked out pretty quickly and with the pathetic turn rate you will rarely be able to respond. When positioning yourself make sure that your flanks are covered. The best way to do this is to position yourself in the centre of a narrow street or park up directly next to a large rock or building. Alternatively try to alert your comrades to your position and needs though if you have my luck then this will be a last resort. Next angle yourself. With a bit of angling you can get your frontal and side armour to be effectively around 100mm thick together, meaning that only F2's will be able to take you from beyond short range. Finally, try to get below a bridge or overhang. Enemy aircraft love the 3" Gun Carrier's large, ponderous form and the thin top armour can be penetrated by some of the heavier armaments carried by fighters. You want to prioritize Panzer IV F2's as these will make mincemeat of your tank. Go for the gunners position unless you have a shot at the hull and are confident that you will take it out in a single shell. T-34's beyond 100 meters are tricky as well, but they also struggle with penetrating your armour. So its best to try and ignore them unless you are confident about it. Everything else should be a relatively easy target, but watch out for the enemy maneuvering to your sides in fast tanks. A tank on your flank is a sure way to get yourself destroyed since a single APHE shell from a German or Soviet tank could knock out the entire crew if it penetrates. In 1941, the British General Staff requested for tanks that can mount a high-velocity cannon. The purpose of this is to create an "expedient design to deal with enemy tanks until the 17-pounder became widespread" due to the risk of a German invasion on the British islands. None of the tanks at the time of this request had the necessary specifications to mount a heavier and larger cannon, the Churchill and Valentine tanks could only hold the 6-pounders. To fix this, it was proposed that a casemate superstructure be used in the design to hold the heavier gun instead, akin to the typical tank destroyer used by Germany and Soviet Union at the time. The company Vauxhall was given 100 of the obsolete 3-inch guns and were tasked to produce a vehicle able to mount these guns. Designing was finished in April 1941, a mock up produced in July, and the first pilot vehicles were finished in early 1942, ready for testing. During these stages, the Department of Tank Design put in an order for 100 of these vehicles. The pilot vehicle was essentially a large 88 mm armoured superstructure with the 3-inch gun mounted in a ball mount, the entire thing was propelled on a Churchill chassis. The tests proved that the vehicles preformed satisfactory and could work, but with the now reduced risk of a German invasion and better equipment becoming to be more widespread, the orders placed on the vehicles wavered to only about 49 vehicles in January 1942. Production for the Carrier, Churchill, 3-inch Gun, Mk I proceeded from May 1942 to November 2, producing 50 3-inch Gun Carriers total. The 3-inch Gun Carrier never saw combat, but it wasn't ignored during its production life. In April 1942, it was proposed that several army tank brigades of Canada be equipped with these 3-inch Gun Carriers, of which 9 would be received and would be split to three troops of three Carriers. It was proposed by Brigadier R.A. Wyman, the commander of the 1st Canadian Army Tank Brigade, that these Carriers be distributed as anti-tank groups. A new company in the brigade system known as the "Heavy Support Company" would man the Carriers and the system would run like an anti-tank regiment in an infantry division. These companies would have about 97 personnel, with 28 headquarters and the rest in the troops, and these were to be assigned to army tank battalions. This was approved in June 24, 1942 by Canadian Military Headquarters and the formation of such unit commenced. Formation of the Heavy Support Company in the 1st Canadian Army Tank brigade drew its ranks from the brigade, with Captain G.S.G. Jones as the commander of the company, nominated by the brigade regiments. Doctrine, organization, and training were discussed in July 15. Despite the preparation, the Carriers were never delivered until September 1942. During training, it was found that the Carriers had a tendency to throw their track while turning at speed higher than 10 mph. In October, the company was redesignated as a "squadron" to conform to armour nomenclature in the Canadian Armoured Corp. By November, there were 10 Carriers available for the squadron. In February 1943, the 1st Canadian Corps then ordered that the Heavy Support Squadron in the 1st Canadian Army Tank Brigade be broken up immediately, perhaps due to the Carrier's growing obsolesce with the evolution of tank warfare. By March 1943, all the Carriers were returned or stored away and the squadron was dismissed. Skin and Camouflages for the 3 inch Gun Carrier in Warthunder Live. This page was last edited on 3 April 2019, at 16:09.